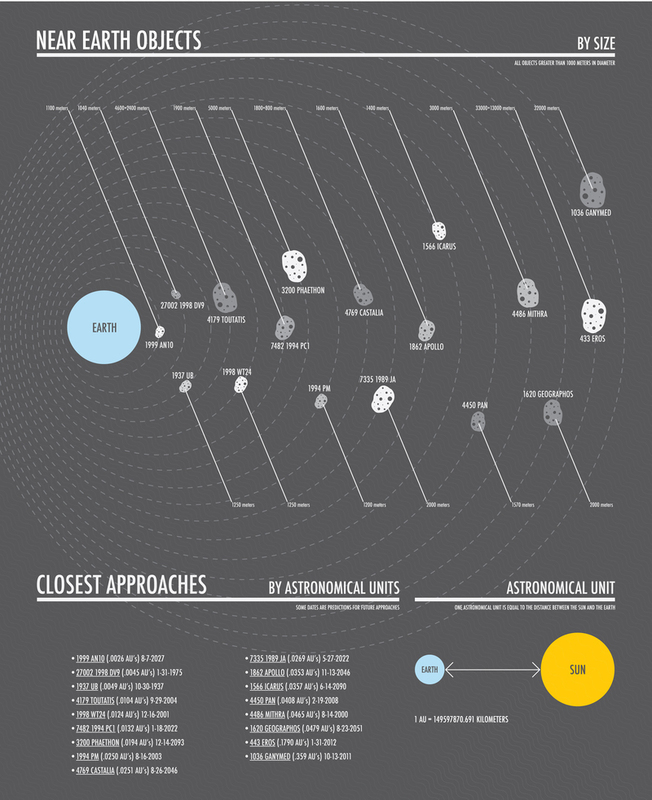 Near Earth Objects (NEOs) is an infographic project made by Zachary Vabolis Graphics designer / illustrator from Mechanicsville, MD. The data is actual data gathered from NASA's public records. Displayed are known near earth objects greater than 1000 meters in diameter and the dates that they will come closest to earth. NEOs are comets and asteroids that have been nudged by the gravitational attraction of nearby planets into orbits that allow them to enter the Earth's neighborhood. Composed mostly of water ice with embedded dust particles, comets originally formed in the cold outer planetary system while most of the rocky asteroids formed in the warmer inner solar system between the orbits of Mars and Jupiter. Excuse me, but this is more like giving false sense of the reality than being the demo of the 'power of data visualization'. The Earth in the size comparison part is in completely wrong scale and the circles around the Earth are not helping the size comparison at all, instead giving false sense about what the picture is for (showing size, not distances). Why are there these 'orbits' at all? What is the purpose? Then comparing distances in list only after the 'orbit' circles is weak, not visualizing a single thing (and using the AU as unit of distance is very out of range and sense! Like if we were measuring cell phone weights in metric tons). If this picture shows the power of something, then it is the power of manipulation/disinformation.